Round Ductwork and Fittings for AutoCAD - The eDuct program by CCAD simplifies the design process of laying out round ductwork and fittings with AutoCAD 2000 and later. The program increases design efficiency, accuracy, and consistency by following typical duct construction rules. With eDucts you can draw a single duct or a straight duct run. Given the diameter, overall length, and maximum length of one section of duct, eDucts calculates the number of ducts and the required length of the last duct to create a straight duct run. Infinite size combinations of fittings, such as elbows, reducers and transitions, are parametrically created by eDucts. Ductwork can be called out using a Leader and note or by generating a Bill of Material with no typing as both commands use size and length data imbedded in each component created by eDucts. 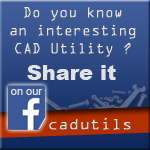 eDucts works with AutoCAD 2000 and later, but does not work with AutoCAD LT.